The best time to prune is late winter, February – March. The goal is to enhance the trees natural form, don’t force it to grow in a small space or prune it into an artificial shape. 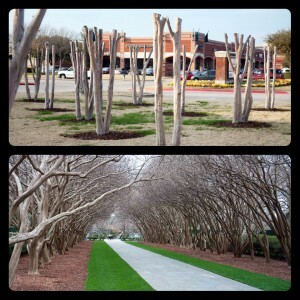 Crape myrtles naturally grow as small upright or Pruning Crape Myrtle Treesvase shaped trees with multiple trunks. A well-pruned crape myrtle will have the trunks grow upward and outward, with branches fanning out rather than growing inward into the center of the tree. Topping (buck horning or dehorning) or “crape murder” involves cutting stems back at an arbitrarily chosen height rather than pruning back to a bud, side branch, or main stem. Topping trees and shrubs are harmful in many ways and regarded as an unacceptable practice by trained horticulturists and arborists. Research shows that stem decay significantly increases when topping cuts are made and that more dead branches also occur within the canopy. The trees are more prone to disease as well with topping. This entry was posted on Wednesday, January 16th, 2019 at 3:40 pm	and is filed under Articles, Garden, Plants. You can follow any responses to this entry through the RSS 2.0 feed. Both comments and pings are currently closed.